The Christmas Season is upon the Knucker Hatch household, and I do believe we are having the most memorable experiences to date. It has taken our family a good while to create our own traditions while striving to hold on to the old of family Christmas’ past. I remember in our first Christmas years as a new family, feeling frustrated that we hadn’t a single tradition of our own, and few to bring to the table from our own families. But this year, over a decade later, we have arrived. The fresh tree has yet to pass our threshold, and the storage boxes packed with the stockings and Christmas decorations have still not been pulled from the garage, but we are already knee deep in welcoming family traditions. The spirit of Christmas is finding its way into the kitchen, and on to the mantle, and into our hearts. Children are prancing around the house dancing to Christmas carols, determined to learn every song title by heart. 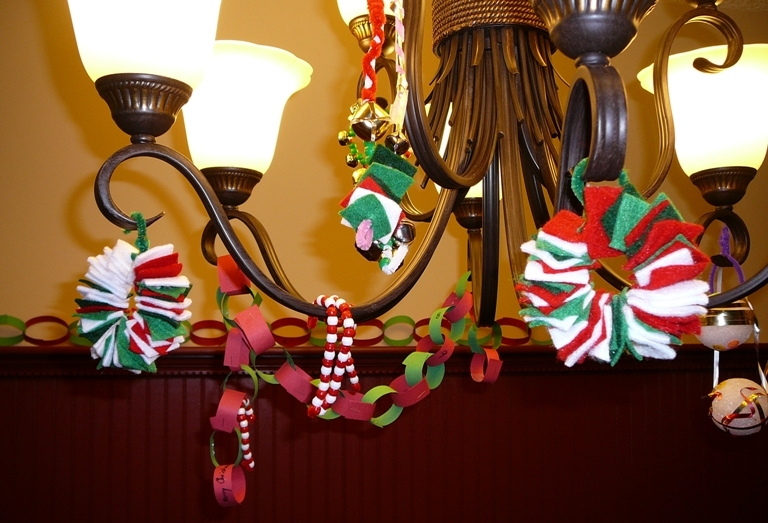 While, little hands have been hard at work creating Christmas countdown paper chains, beaded pipe cleaner candy canes, felt holly wreath ornaments, and paper snowflakes. I’ve been inspired to do a family advent activity calendar, which keeps the children waking up happily with a “What’s the Christmas activity today, Mom?”. Tom Builder and I have spent and will spend many more nights perfecting his Grandma’s elusive fudge recipe. I think this year, we’ve almost cracked the fudge code (Grandma’s fudge was not creamy, but had a slight grainy hardness…in other words slightly off the mark, but what Tom Builder’s side of the family grew to know and love as Grandma’s treasured fudge). We will add to our new traditions of whipping up some killer addictive peanut brittle, and creating our famous Christmas cookie tree, with some new candies like peppermint bark to try this year. And tonight, the kitchen prepares for a gathering of friends tomorrow that will last all day and through the night – thousands of flavored biscotti will be baked, iced, and wrapped for company customers, as we assist with a lofty gift giving tradition started by the brave wife of Mr. Incredible’s business partner. Meanwhile, nine children will be weaving in and out of our baking with squeals of laughter and much hootin’ and hollerin’. In the background, there are Christmas parties to attend and a company party to host (which scares me to death) and all of the Christmas shopping. But for some reason, this time, I’m not falling prey to the mad Christmas rush. To the dark bundles of stress, worry, and distraction that I so often carry around during December and almost seem to open my arms willingly to catch. This year, I am finding true joy in the season. Meaningfulness. Every December day. Shared with loved ones. Traditions treasured up and memories held close. When do we make the popcorn balls? Amorette, Sounds wonderful Mama! Enjoying Christmas-time here too! Music, great books a FEW decorations this year..advent wreath, “Adorenaments”..we have gone carrolling with friends every year. 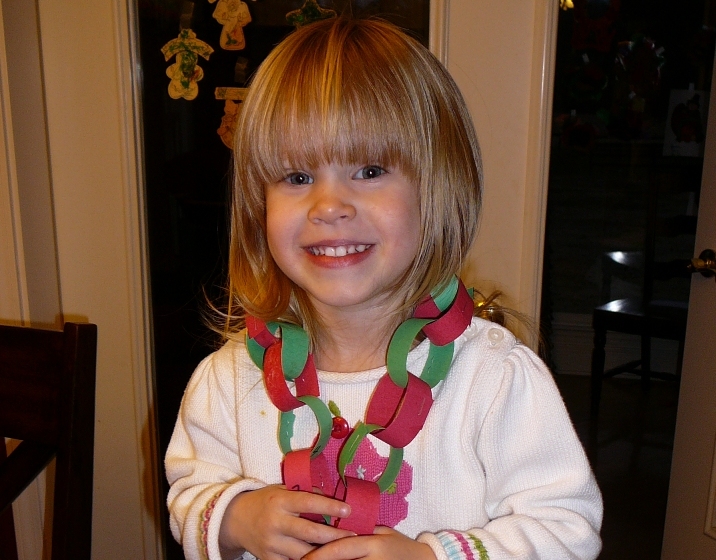 Can you please answer a question for me….I feel silly asking, but where do you get the materials for a paper chain? I realize that I could cut the links myself and we could glue them. is that what you do? Cut the links yourself and use a glue stick? Or is there some way to buy these so that we can just assemble them. Please bear with me…we have 5 children age 6 and under so I keep it simple. Mary Brooke, we have the large rectangular construction paper, and I would simply lay a red paper over a green paper and cut strips down the width. We didn’t worry ourselves with the perfection of perfect strips. I found that if you leave the widths at that size, a glue sticks works fine. But for Faith we cut the widths in half and had to use a stapler. The other thing that helps the kids keep track of the links is to mark each one with the number of the day. I can only imagine your house this Christmas and Christmas’ to come! Merry Christmas! I am happy to hear that others are experiencing the same things I am this season…Meaningfulness and feeling the rush all around me, but having NO INTENTIONS of getting involved in it. I am so tired of Christmas not being celebrated the way it was intended…humbly and with great love and giving of time, not gifts (though there will be a couple of those too). That’s what it’s all about around here this year! Thanks for the wonderful blogsite. I stumbled upon you when searching out a family responsibility chart. Up popped “ourgoldenapples” and I have been hooked ever since. It is refreshing to read about your adventures as a woman of faith. Keep up all the inspiring work. Reason for comment: I love your family activity advent. 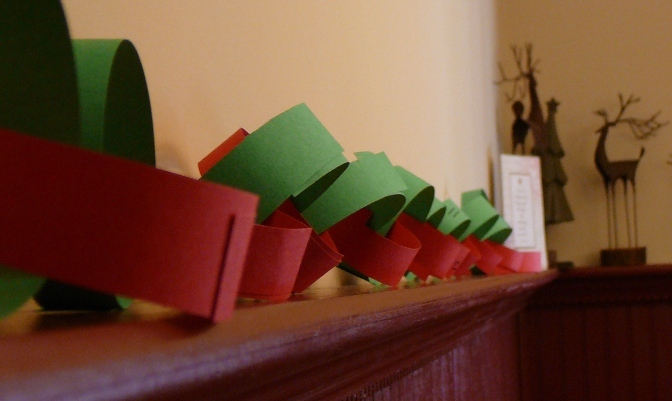 What better way to count down to Christmas than by doing activities with your family! We’ll be starting this tonight. I’m looking forward to next Christmas. If God grants my wish, we will have a “Nana & Papa’s” house near you to start our own traditions with the grandchildren. Can’t wait to hear the pitter-patter of those little feet running through my house. What a great post! His grandmother’s fudge sounds like my mom’s…she says it used to be on the back of the Hershey’s Cocoa boxes years ago. I have not been able to duplicate it on my own yet, but really need to figure it out! There really is a science to it, and part of it involves having no humidity…for whatever reason, that causes it not to “set up” properly. I would love your homeade biscotti recipe if you give it out! I have been looking for a good one :). Congratulations on your baby girl coming soon! !